And sadly, I don’t mean precocious, crime-fighting, scream-while-aftershave-slapping Macauley. I’m talking about the ninety-eight pound, chain-smoking, allegedly-heroin-addicted Macauley. Scruffy-haired, thin and always jonesing for … well, let me back up a little. Anyway …. last month, something sad happened. And I haven’t wanted to write about it until now. On Christmas night, after we returned home from a long day of gluttony and family togetherness, I went to Viv’s room to check on Herve. And what I found there was a little disturbing. I took one look at Herve and knew he wasn’t right. His head was upturned to the right, he was woefully unbalanced and he was manically active. I panicked. And I called out to Dave and Vivien. They both came immediately but Vivien was so upset that she fled the room in tears. Dave thought I was crazy for calling her in to see him in the first place. Honestly, I didn’t think Herve was going to make it through the night. And I knew she’d never forgive me if I kept him from her on his last day. She was crying. And I was crying. Me. About a hamster. Honestly, I was as surprised about that happening as you probably are reading that it happened. It’s just that we all really care about the little guy. Not only is he adorable, but he’s one of the sweetest, gentlest little creatures I’ve ever met. He’s only nipped me once (pardon the pun) and that totally was not his fault. Seriously, what’s not to love? The next three days were sort of touch and go. Viv and I both stayed close to home and checked on him often. Truth? I was so certain every time that I was going to find him dead that I made Dave accompany me … every time. But then he didn’t die. We made it through Friday, Saturday, Sunday and even Monday … and he was still wobbling around a lot but still going strong. When he was still with us on Monday morning, I decided it was time to take action. For those of you who have been around a while, you may remember that there’s actually an exotic vet in my neck of the woods. And, last summer, I actually took Herve to that exotic vet for a much lesser issue. So, needless to say, I called the veterinary office to explain what was going on with him. They agreed to see him that very afternoon. Both kids came with me to his appointment. And, unlike Herve’s last visit, we all three got to go into the examination room with him this time. The doctor was great. It turned out she’s married to an old co-worker friend of mine. She was wonderful with our little guy. And she explained that, while it was possible that Herve was dealing with an inner ear infection, it was more likely that he’d suffered a stroke on Christmas Day. Exactly what I suspected. We left the office with three different medications and special food that we were supposed to administer to him with a syringe. Were we up for it? Well, of course, we were. What you guys don’t know is that I had a diabetic cat named Toby who required two daily shots of insulin a day for EIGHT YEARS. 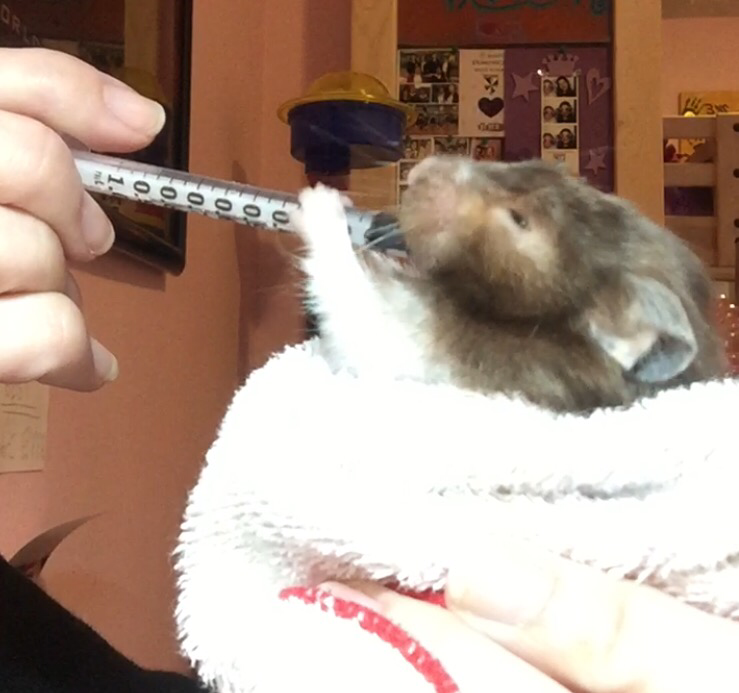 And how hard could it be to administer three prescriptions medications to a hamster, right? Actually, it really was easy. Especially for one of the medications. The first was for infection. He liked it okay. And now he’s finished with that one. The second was for imbalance. He liked it a little less than okay. But it’s also finished. And the third? The third is a pain medication. Notice I said “is” because he’s still on it. Think of it as a morphine drip of sorts. Something to “keep him comfortable for the rest of his days.” And he absolutely LOVES THE EVERLIVING CRAP out of it. He knows when I’m coming in to give it to him. He runs to the door of his cage and jumps (read: stumbles uncoordinatedly) into my hand. He can smell it. Sense it. Already taste it. See those grabby, little hands? That’s the pain meds at work. We never saw that kind of passion with the antibiotic. He’d take the whole syringe into his bulging cheek pocket if I didn’t keep such a a tight grip on it. This entry was posted in Uncategorized and tagged exotic vet, hamster, herve, my hamster had a stroke, pain meds for a hamster. Bookmark the permalink. Here’s to Herve having a much longer life than Mac’s musical career. Guap, I’ve actually heard of the band. I even took the time to watch a YouTube clip. Wow. I’m sure the hip would say I don’t get it. Of course, with instruments like the kazoo, the glockenspiel and a pizza box, I don’t WANT it. My niece Robin gave me her hamster Cuddles (a teddy bear hammy) and I think I killed it. He was a nipper. I have to say, after reading your posts for a long time and becoming very fond of the little guy, I found my heart getting ready to drop. I am overly pet sensitive. My cats are my babies and I would do anything for them. Glad to hear that Herve is still with us. Here’s hoping he has many more days ahead. Stay strong little dude! A morphine addicted hamster. Too funny. You better not hold out on his meds though. If he gets the DT’s he might get more than a little nippy! Poor little hammy! Stay strong little dude! That Macaulay- he just does not look good these days!!! I wanted to cry. I now want to laugh. I hope Herve is doing ok.